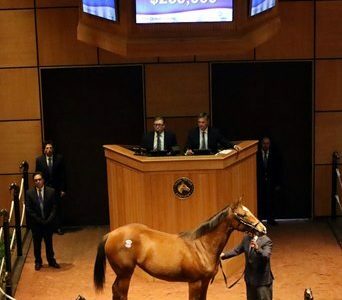 Demand for yearlings sired by red-hot Spendthrift stallion Into Mischief continued to be strong during the Oct. 26 session of the Fasig-Tipton October yearling sale, with a filly sold for $260,000. Consigned as Hip 1299 by Four Star Sales, the filly was purchased by Tracy Farmer, with trainer Mark Casse signing the ticket, providing a Glencrest partnership with a healthy return on the $95,000 paid for the then-just-turned yearling at this year’s Keeneland January mixed sale. Bred in Kentucky by John Kerber and Iveta Kerber, the filly is out of the A.P. Indy mare Limbo and is a half sister to multiple stakes winner Gentleman Chester and stakes winner Back Forty. The filly’s second dam is two-time champion Northernette, a full sister to leading sire Storm Bird. 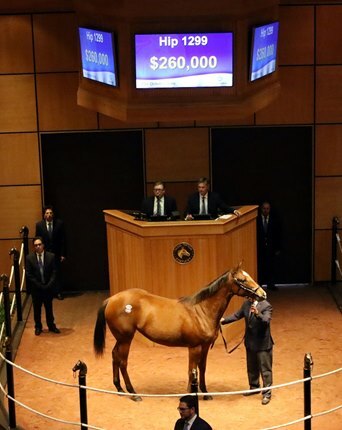 Sent to the Fasig-Tipton Kentucky July yearling sale, the filly was bought back on a final bid of $165,000 and Thursday’s sale showed she had improved in the interim. Greathouse said the filly was the second foal he had purchased by Into Mischief, a stallion on which he is bullish.